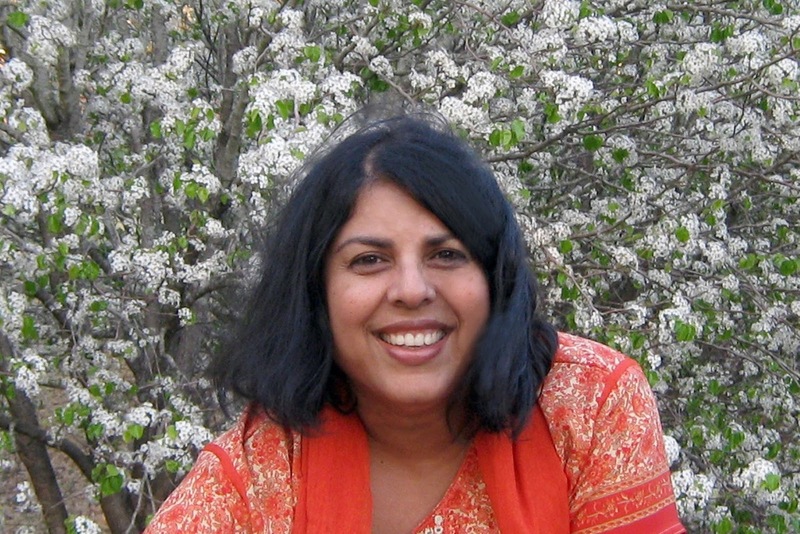 Chitra Banerjee Divakaruni’s name is synonymous with Indian American fiction. She needs little or no introduction. This is one author who has addressed this subject with readers of all ages, be it school children, young adult or adult. 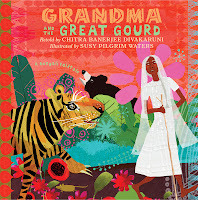 Her books are insightful, the themes are universal and the characters are introspective. In honor of Chitra Divakaruni's two new books launched this month Suprose will feature her as author of the month yet another time. Her novel Oleander Girl is already getting rave reviews. 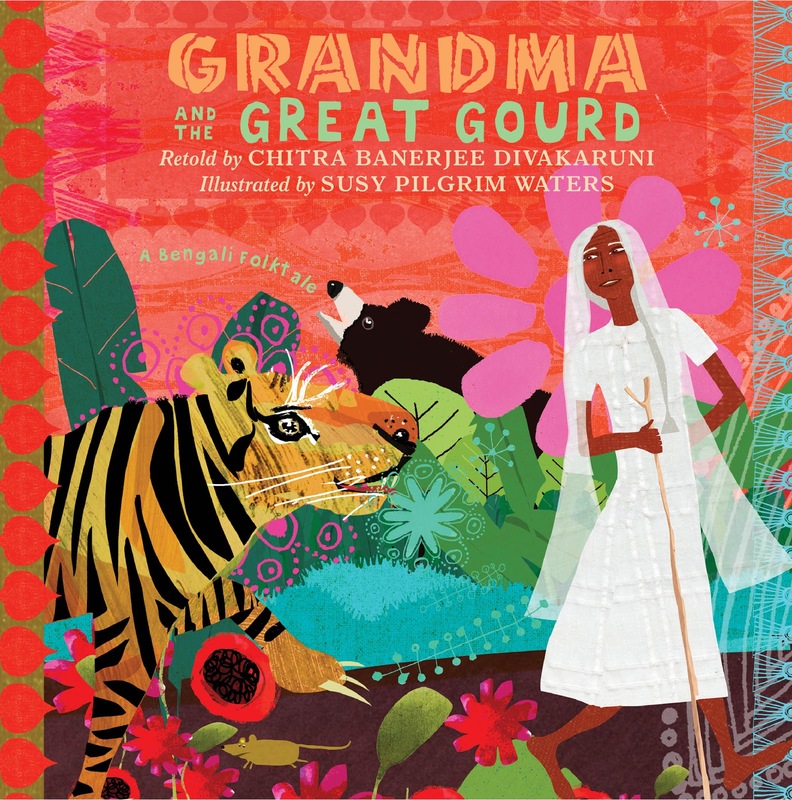 She also has a second book out this month for young readers aged 5-8 titled "Grandma And The Great Gourd" - A Bengali Folktale. I recently had the pleasure of interviewing Chitra Banerjee Divakaruni for the Wall Street Journal for an article at this link. What inspires you to write? What do you love most about writing? It is very hard for a writer to switch hats from writing for 10 year old audiences to YA, to writing literary fiction for adults. How do you do it? Each book is a separate entity for me. When I’m writing it, I enter its world and inhabit its vocabulary. I forget, as it were, that I ever wrote anything else. I have a lot of respect and love for children’s books, and some very good models (Phillip Pullman, particularly, that have made me realize that literary fiction can be written for all ages). I think all this helps me write these different kinds of books. Who or what was the inspiration for Oleander Girl? I wanted to write a book about the important of tolerance—tolerance for people who look different, have different religions and ideologies. That led me to place the novel in 2002, a little after 9/11 and during the Godhra riots, two horrific events-- and their aftermath--rising out of intolerance. As I wrote the book, I realized that parts of it were woven from my family history, and Korobi’s grandfather took on some characteristics of my own grandfather. How long did it take you to write it, as compared to your other books? It took me about two and a half years. That’s what it takes me, usually, unless I have to do mega-research, as well I was writing Palace of Illusions, which is based on the The Mahabharat. I had to study several different versions of the epic before I could write anything. For Oleander, the research was important, but it was more contemporary—New York geography and the character of its different boroughs, for instance; or the properties of the Oleander, which is severly poisonous. I love how in Oleander Girl characters grew and developed in ways I had not anticipated. The chauffeur Asif, for instance, was meant to be a minor character but ends up to be extremely important, both plot-wise and thematically. He kind of took over his scenes. I love the organic energy that’s released in a novel when a character does that. You mention in your FB page that a passage from OG was inspired by the painter Raza. Which passage was it? Please explain why the painting evoked this particular passage? This was when Korobi visits Mrs. Bose, her mother-in-law to be, the owner of a leading art gallery in Kolkata. I love contemporary Indian art, and I imagined that gallery to be filled with paintings by my favorite artists, Raza among them. I imagined her—she’s not like anyone I know, and in some intrinsic ways, she is different from the women in my other books. I wanted to create a character who would embody the clash between the old and new India. Someone both vulnerable and strong. I don’t really know where she came from! It’s a mystery to me. It is not fair to ask you to pick your favorite character from a book… So, Who was your most challenging character in OG? How did this one come to be? I think Korobi’s mother-in-law to be, Mrs. Bose, was my most challenging character. I wanted her to be the antagonist in the book, (or one of them, at least). I wanted to give her some complicated traits—for instance, she cares too much about what society thinks of her, she is manipulative, and she is disapproving of Korobi; but I wanted the reader to understand why she was this way, what hurtful experiences in her past had led her to this place. I wanted the reader to be torn between compassion and outrage. Writing about religious difference and the violence it can lead to—that was a tough one. I wanted to make sure the theme developed naturally, through the personalities of the characters. I wanted to make sure I wasn’t heavy handed. Which of all your novels was the most difficult to bring together and why? Probably this one and my previous one, One Amazing Thing. This one because I wanted to write the story of an individual (Korobi) in a way that mirrors a particular juncture in the life of a country (India). I wanted to show that a personal story (who Korobi’s mother falls in love with, and the repercussions of that) can have political significance. One Amazing Thing was challenging in a different way—that novel had nine protagonists, all equally important. I had to move in and out of all their heads as dexterously as I could manage! It’s never really easy to be successful as a writer when you’re trying to write literary fiction—you’ve already limited your readership limited by that choice. As I’ve written more, and as other Indian American voices have grown around me, I strive harder to find experiences that are unique yet a meaningful and resonant part of the American story. What books do you currently have on your reading pile? I’m reading the Ramayana—that’s my next project, to write a novel that reimagines that epic, narrated by Sita, one of the major women characters in the epic. Which authors do you go to for solace during a tough moment during your writing process? I go to the people whose books taught me how to write: Maxine Hong Kingston, Toni Morrison, Anita Desai, Amitav Ghosh, Margaret Atwood, Tim O’Brien, Sandra Cisneros, Rabindranath Tagore. I re-read them, I re-learn, and am re-inspired. I have always loved this author and cannot wait to lose myself in her new book. She inspires me to carry on, validates the demons perched beneath my fingers, and generally steadies my forever questioning need to write. Thank you for this interview. Have you done your creative bit for the day? Amanda Palmer On The Art Of Asking!